Many reviewers have compared this latest novel to Picoult's earlier novel, My Sister's Keeper. Though I can see the resemblances in the novels, My Sister's Keeper is a far superior piece of work, in my opinion. I have read all of Picoult's novels and have a few that I like more than others. This one is definately not one of my favorites. My opnion has less to do with writing style, as I do enjoy the way Jodi offers the story from the perspectives of several of her characters. I also don't have an issue as many others seemed to have with the fact that there are a lot of sub plots in this book. This, in my opinion, makes it that much more interesting. My problem with this book is probably more of a biased opinion. I had a very had time "connecting" with the primary character in the book, Charlotte (the mom). As the mother of two children with special needs (one of which has a terminal condition), I found it very hard to be sympathetic with her battle to sue her doctor, and more importantly, best friend for "wrongful birth". She is suing not, necessarily because she feels she would have aborted her chronically ill child but because she feels the money would offer a better life for this child and would aid in paying off medical bills. I should also mention that I live in New Hampshire and am extremely familiar with the type of medical assistance available to families with disabled children and I found a lot of inconsistancies in the book as far as that goes. In my personal opinion, I just cannot fathom alienating my husband and best friend just to make a buck (or several million). In an effort to save her family, Charlotte all but destroys it and I simply don't get that. To say that Jodi Picoult writes issues books is an oversimplification. Don't get me wrong - she does write issues book & can be somewhat formulaic; at the same time she manages to create characters you can believe in & puts them in situations that are also very real. What if your son & his girlfriend have a suicide pact, but only the girlfriend dies? What if your daughter's boyfriend (& son of your close friends) date rapes her? What if your child has a deadly disease & you have a second child to be her donor & your second child gets sick of doing that? What if your small son is sexually abused? There are common threads, for sure, in all of these books - they all tackle an issue, they're all set in suburban New England, the characters are all white & fairly safely lower to upper middle class. I think she's successful at this beyond the entertainment value & beyond the formulaic nature of the genre because she doesn't take the easy path with her characters. These are not books about heroic mothers curing the cancer of their 6-year-olds while coaching their son's soccer team to the world championship. These are books about flawed, real people in tough situations who don't always make good choices & that's why they work on so many levels. Having said all of that, I like this one least of all of her books. As most people have or will point out, this book is a lot like her book, My Sister's Keeper. Both deal with a mortally ill child, sibling conflict, & a lawsuit. In this case, Willow is born with osteogensis imperfecta, a genetic disorder that makes her bones exceedingly fragile & prone to breakage. Her mother decides to sue her obstetrician (& best friend) & the rest of the novel revolves around the consequences of this lawsuit for the whole family, including Amelia, Willow's older & often ignored sister. Charlotte, the mother, is not a picture of martyred perfection (thank God). While her choices may be questionable, her motive - more money to help pay for all of the things that her daughter will need in her lifetime of care - is not. Yes, the suit requires that she claim wrongful birth, but that isn't really her fault. Nor is it her fault that our current healthcare system makes long-term care of disabled people nigh on to impossible for most families who literally break under the financial strain. This book & this character very clearly illustrate the poor choices that are often available to people in this situation. I liked all of the rest of the characters, too, although they were at times less successful & more thinly written. I would have, in particular, liked for Piper (the obstetrician & best friend) to have been more fleshed out. I even liked the children who seemed like real (& sometimes bratty) kids rather than the paragons of childlike virtue or evil that many writers thrust upon us. I was much less fond of the technique of all of the characters addressing Willow throughout the book - as if you were Willow & they were telling you the story. It seemed just that - technique - & very forced in places which took me out of the world of the story. The ending, which I won't reveal here, was one of those twists that seemed tacked on just to create a twist. It was unnecessary & I really disliked it. A good book cheapened by the ending. I was all set to give this book 5 stars. And I would have done so were it not for the last chapter. That last chapter cheapened the story and made the effort of reading this very harrowing book worthless for me. I found Handle with Care a very compelling and affecting book, despite the many plots and very distracting and bizarely included recipes...Why? If you liked "My Sisters Keeper", then you may get a sense of deja vu reading this book. I know I did. Both books feature sick children and affect on their families. The difference is that My Sisters Keeper was fresh and surprising - this book, well, we have read it before so I was bored a little. A lot of thought, research and writing went into this book, yet once again, the ending is wrapped up unsatisfactorily.....I actually re-read the last chapter, thinking I must have missed something crucial! This seems to be a trademark ending of this author: bad endings because its like she doesn't know what to do with her characters. After reading about 5 books by this author now, this one was definitely my last! HANDLE WITH CARE was, like all of Jodi Picoult's books, excellent! Her research into the subject of her novels is interesting and thorough. I especially like how Jodi tells the story from the different characters' points of view. I cannot wait to read every new book written by Jodi. Picoult has written another novel that begs the reader to ask themselves what would they do in this situation. She does a great job capturing the emotional toll on each family member. The story kept me interested from the very beginning. The ending was a bit abrupt and not what I would have expected. Seemed a little odd having recipes in a fictional story. This was the first Jodi Picoult book that I read and it very well may be my last. I got through the first half of the book feeling sorry for many of the characters as they found themselves in a challenging situation caring for their special needs child. Then the mother - Charlotte - decides to go against her own morales, her best friend, and her husband to do something that she feels will better the life of her child. She blindly and stubbornly moves forward with her plan threatening every relationship in her life and pushes her children to doubting her love for them. The whole time I was reading this I tried to determine if this is something I could understand even if I would not do it (not being a particularly litigious person). But I just kept coming back to other stones that had not been turned...appealing to the OI community to find out what other people had done to support their needs, working with community service groups, etc. This was such a radical move on her part that it was not believable. AND THEN as I was stuggling to keep an open mind, I read the ending and was completely aghast. To have written that book and weave all the characters through their suffering to get to the end result was like a slap in the face. I felt like I wasted two days reading a book that resulted in nothing. The O'Keefe family is just like many others - two children, ice skating practice, sibling rivalry, a trip to Disney World. Their world is often thrown into disarray, however, because their younger daughter, Willow, was born with osteogenesis imperfecta, brittle bones disease. This diagnosis means that Willow is likely to suffer a broken bone from even the most minor of reasons. She might bump into a table, sit down too hard, even turn too suddenly, and end up needing a splint, a cast, an emergency surgery. Despite this, the family has been a healthy unit, although one whose finances are in shambles and with little knowledge of how Willow will receive the adaptive technology and care she will require as the symptoms of her illness progressively worsen with age. One day, the mother, Charlotte, is given an answer. A lawyer broaches the topic of a wrongful birth law suit - one that says her OB-GYN was negligent in not discovering Willow's condition earlier in Charlotte's pregnancy - early enough that Charlotte would have been able to make the decision to abort her fetus. In the resultant trial, Charlotte is willing to risk everything - her reputation as a mother and position within the community, her marriage, her relationship with her daughters, if it means promising Willow enough money to live as full a life as possible. Quote: "You can tell yourself that you would be willing to lose everything you have in order to get something you want. But it's a catch-22: all of those things you're willing ot lose are what make you recognizable. Lose them, and you've lost yourself." Jodi Picoult is usually able to write a book from several different perspectives and make each sympathetic in its own way, shades of gray situations. Despite her intentions here, however, this is not successfully achieved with Handle with Care. Despite the attempts to justify the mother's actions as ensuring financial stability for her daughter, it's too difficult to understand how Charlotte does not comprehend that financial stability means nothing without the emotional and mental stability that is shattered when your mother tells the world "I wish I could have aborted you. You are too imperfect for me to have wanted you in my family." There is also the complication that Charlotte's OB-GYN was also, seemingly, her only friend in the world, and that she must ruin this woman's life in order to bring the suit, which seems not to faze her at all, or that her family fractures more every day as a result of her decision. My fiance watched for two nights as I went between laughing out loud, to biting my lips, to crying like a baby ("How do you get that into your books?" None of the books he reads have authors who could compare to Mrs.Piccoult, that's how!). The book was such an emotional rollercoaster that at times I HAD to put it down just to take a breather. Yet it was so good, I finished it in two nights because I just could not put it down otherwise. I have almost all her books, and this was the best one. There was one part of the book where the older sister was describing how it felt when she cut herself. As someone who has battled Borderline Personality and has been so fearful and ashamed of someone finding out my secret, she managed to put into words what I have only kept in my head and heart for years. Someone commented that the behavior is not typical of a 12 year old. Maybe a young teen, but even that is stretching? Lucky you were a young age twelve! With no hardships, huh? You would know that a twelve year old with such issues in the household may have behaviors and feelings above her actual age. I read another review where someone said the second person was sloppy due to the older sister saying "my mother" instead of "our" mother among other things. But these are the feelings of a teen girl, who is feeling possesive of a mother who, she feels, has invested all her time and emotion to a younger sister. I feel it is highly appropriate. Someone else didn't get the recipes in the book. I get it. To me, I feel it as a book of recipes the mother wrote after Willow died and probably dedicated it to her. As far as calling Willows death a cop out, um hello? The point is, she could not protect her daughter from accidents that DO happen that have nothing to do with her special disease. As far as predictable? yes, it is obvious by the fact that these people are writing to Willow that she either dies or is possibly on her death bed. But the manner of death, and lesson from it, were a surprise to me! A My Sister's Keeper clone? Not at all. The only similarity I see is a court case with a controversial lawsuit and a death of a sibling. I wonder how these people even enjoy books when they can't even get the point! Great book. I will read it again and again (as soon as I get it back from my mother, who I made stop all her other books until she read this one).I hope they make a movie from this one, but it would probably not do it justice. That is just the tip of the iceburg. So many mini plots can be derived from all the different storytellers in this book. I loved it! //Handle With Care// is suspiciously similar to Ms. Picoult's earlier blockbuster, //My Sister's Keeper//. Both involve young children with devastating illnesses, families teetering on the brink of breakdown, sisters torn between loyalty and a desire to be free of the incessant demands of illness, and emotional courtroom drama scenes. It would be easy to say that Ms. Picoult is simply coasting on her earlier successes - easy, that is, if //Handle With Care// weren't such a well-written, thought-provoking book. The story is told by a series of voices - Charlotte, Sean, Amelia, Piper, and Marin - who relate their thoughts and memories to Willow O'Keefe, a brilliant six-year old girl who is funny, caring, and cursed with osteogenesis imperfecta, a disorder that makes her bones fragile enough to shatter at the slightest fall, bump, or twist. Willow and her family live under the constant shadow of the disease. When Willow's mother, Charlotte, decides to bring a wrongful birth lawsuit against her obstetrician - her best friend, Piper - she learns that bones aren't the only things that can be broken. Despite a contrived and completely needless ending, //Handle With Care// is a book for mothers, especially mothers of children with disabilities, who will appreciate it for its honesty. Handle Wtih Care is a great read. As the reader you will fall in love with Willow, feel great sadness for her sister, and thank all of your lucky stars that YOUR children are healthy. I enjoyed the book very much, except the end. It was abrupt, and felt rushed. But, I could easily put myself in the place of this beleagured mother, and the burden of trying to take care of a child who is so fragile that a wrong move could break any bone in her body, because I have a child with a rare genetic syndrome. I have a husband, and an older child too. I lived many of the same kinds of days that this mother experienced. In one word: challenging. (Heart-breaking as a close hyphenated second.) And given that Picoult is the author, by "challenging" I do not mean to read; but, to think about. The questions you are forced to wrestle with are, classically Picoult, not easy ones. I enjoy reading Jodi Picoult's books. I'm a big fan of hers and look forward to her future novels! The recipes in this story were a great addition, especially the last one. I also appreciated where Jodi wrote about Amazon.com and people leaving negative reviews and hurting the author's feelings. Nice touch! I loved Marin's character. Jodi kept me interested in finding out why Marin's mother gave her up. The end result was not what I expected (just like Marin). I think Marin's character will return at some point in a future JP book. Kudos to Jodi for another page turner! I'm looking forward to her next novel, House Rules. Wow - since I read my first Jodi Picoult about three years ago I knew to expect a thought-provoking book. One thing I love about Ms. Picoult's novels is the fact that she brings interesting and controversial topics to light but doesn't tell you how to feel one way or the other about it, which is unusual in today's world. We all have our opinions and believe they are right. No doubt Ms. Picoult has her opinions too, but she chooses to bring all sides of a topic to light. Handle with Care is another great example of this. Making the wrongful birth lawsuit front and center and how it really makes different people feel. From the one who is being told that she shouldn't have been born (but that is a lie mommy is telling), to the sibling who is unintentionallly left behind in the dust of the lawsuit, to the marriage that takes second place at this point and to others it affects such as the doctor and best friend and the whole community of disabled people who essentially are told that their lives are not perfect and therefore not worth living. I think I have had the same thoughts as each of the characters and it really pointed out some things to me that I feel that are wrong in my own beliefs. It's definitely opened my eyes to several different things. While the issue is a part of this book, but definitely not the whole. I felt like I truly got to know all the characters. I listened to this on audio and it was wonderful. They used different people for the different characters in the book who were writing to Willow at the time. The distinguing voices were a big help with listening. It was a true joy to listen to. The story never lagged for me, in fact I would find myself listening in the car a few extra minutes, carrying my mp3 player with me to listen when I could. The story moves forward at a good pace, the characters seem real and the story is just riveting. 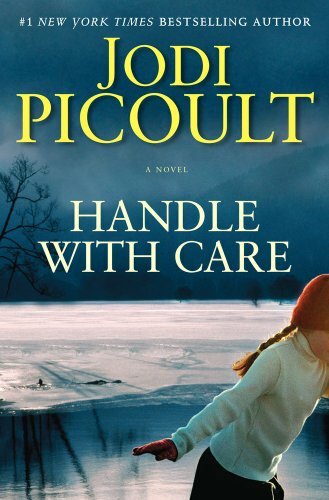 Handle With Care, Jodi Picoult's latest novel, is the story of the O'Keefe family: Sean, a police officer; Charlotte, a former pastry chef turned full-time mother and caretaker; Amelia, a 13-year-old yearning for independence and control over her life; and Willow, a 5-year-old struggling with OI, brittle bone disease. Day-to-day life is stressful enough for this struggling family, but a trip to Disney World turns disastrous. Willow falls and breaks a bone, and they're rushed to the hospital, seemingly at the relief of park employees. Willow's x-rays raise red flags of abuse, and Amelia spends the night in a foster home, while the parents are separated and interrogated. It's gut-wrenching, and the reader understands the caution from the police and hospital while knowing these parents are loving. From there, the story spirals out of control. Sean wants to sue for what they went through in Florida, but the lawyer says that's not a case. A wrongful birth suit is an option, however. Did I mention Charlotte's obgyn is not only her best friend but the one who introduced her to Sean? Perhaps it's because I don't have children, but I found Charlotte to a completely unsympathetic character. I was upset that Picoult's thanks and acknowledgments at the beginning of the book included a spoiler. She mentions she changed the process of how jury's are selected in New Hampshire. I imagine there would have been much more suspense about if a trial would actually happen in the first half of the book if I didn't read in the thank yous that one did. Keep in mind, I try to avoid book flap summaries for spoilers too; I like to go into books (and movies) knowing little to nothing about the plot. I rely on the opinions of reviewers and friends much more than on plot synopses. Part of me loved the book; I read it's almost 500 pages in less than 24 hours. I even found myself most engrossed with Marin, Charlotte's lawyer, searching for her own birth mother. I found her storyline most compelling. Wrongful birth is a fascinating issue, but it's an issue tied to the broken health insurance system in this country. Socialized medicine would alleviate all of the problems Charlotte faced, and as an advocate for equal access to health care regardless of disease, condition or income, I found myself bogged down in not only the politics of choice but of the inherent flaws in a health insurance system seeking to make money rather than help and protect people. I listened to the audio version of this book and I really liked it, for the narrators (there are 5 or more) did a really great job. They brought out the personality of each character, you'd feel like you knew each character well. So i'd give the audio performers 5 stars. The style of this book is too gimmicky, by addressing the girl through second pronoun. It does not bring out the intimacy but instead seems forced. And the recipes Picoult sprinkles throughout the book are distracting at best and don't add to the story at all. Plot-wise, it seems Picoult pulls out a template everytime she writes a book. You read one, you read them all. This book is a combination of many of her books, especially My Sister's Keeper and The Pact. She is obsessed with situations where people who are close sue each other. And the court room scenes always give you a deja-vu feeling, such as when the plaintiff and the defendant always found themselves in the bathroom, confronting each other after a lengthy and exhausting fight. I could guess what came next down to the twist ending. So 2 stars for the story. I hope Picoult would write something different, something without a courtroom drama. I like her writing but she needs to get out of her comfort zone. For example, Stephen King's Just After Sunset, he has more variety in one book than Picoult has in all of hers. What responsibility does a health care provider have when a child is born with a severe disability? That is the question Jodi Picoult asks in her latest book. Sean and Charlotte O'Keefe have it all: jobs they love, cute daughter, happy home, and the pregnancy they've waited for months for. But their perfect lives come to an abrupt end when the fetus Charlotte is pregnant with is diagnosed with OI ("brittle bone" disease). Raising Willow turns out to be very challenging, what with the medical emergencies, high doctor bills, and the unknown prognosis for her future. When Charlotte and Sean are given the option of a lawsuit for wrongful death, they think this may be the way to give Willow financial stability for the future. But this stability comes at a big cost: one that will have major repercutions for their entire family as well as their close friends. I would give Picoult four stars for her writing style and her ability to draw the reader into the story. Having said that, I was just plain mad at the way this book unfolded. There were many similarities to My Sister's Keeper which is probably my favorite Picoult book. I learned a lot about osteogenesis imperfecta which was interesting but often repetitive. I think Picoult has gone the way of Anita Shreve... great writer but dark and unhappy. I need a book a bit more uplifting than her more recent books. As one who tends to shy away from books with the heavier theme, as I read more for escape and pleasure, I found myself completely hooked. This book is captivating. The writing is detailed and it is easy to visualize the situations the characters face. As a parent, it made me think for a moment how out lives would be so different if we had a family member with a disability and/or serious illness. And though I didn't like the ending at all, it could not have ended another way. There are elements of the writing style though that didn't work, such as the adults all writing to Willow, when clearly some subject matter was not appropriate for a six year old. The characters in the story are compelling, really held my attention. Some of the sub-plots are predictable while others caught me way off guard. I did not see the ending coming at all and it is intense. I kept wanting to check the ending while reading the book, which is not something I typically do unless I don't care about the story and just jump to the end. That was not the case at all, I just couldn't get through it fast enough. Overall, a strong quick read. Good book if you know others who have read it, b/c you will want to talk about it. ONE OF JODI PICOULT'S BEST! This story is filled with facts but isnt believable. When they met, Sean O'Keefe, a cop, and Charlotte, a pastry chef, hit it off immediately. She was raising Amelia, 5, alone. Seven years later they had a daughter they named Willow. Willow was born with osteogenesis imperfect. The condition had been unnoticed by the OB-GYN doctor, Piper, who was Charlotte's best friend. Piper Reece was married to Rob, an orthodontist. They had a daughter named Emma who was Amelia's best friend. When Willow was five, Charlotte decided to sue Piper to get money for Willow's care. The lawyer she hired, Marin Gates, was looking for her birth mother and had conflicting feelings about the case.